Globally the most widespread passwords are still “123456” and “password” as well as other very simple ones. This seemed just too terrible to us, so we ordered another survey in Ireland, to see if the Irish are any smarter than that. Well, we’re happy to say, yes they are! At least a bit. 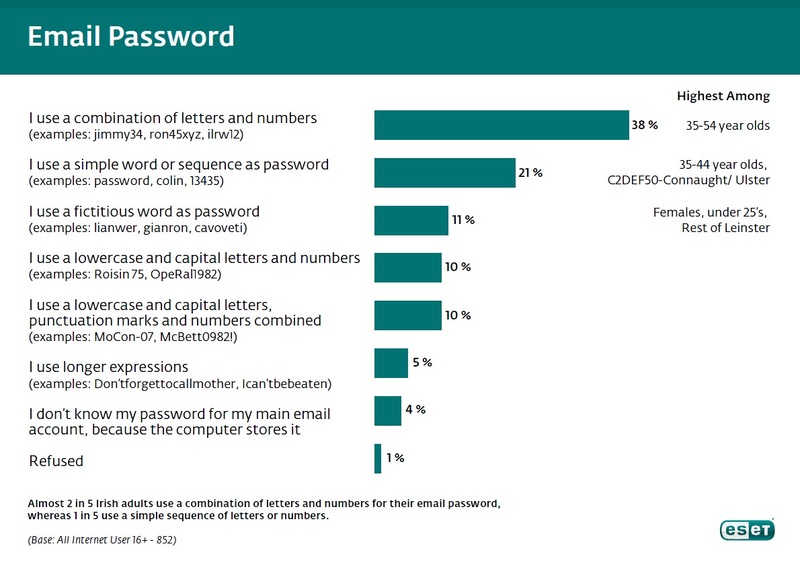 ESET Ireland had a survey conducted to find out what sort of passwords the Irish use and how secure they are. 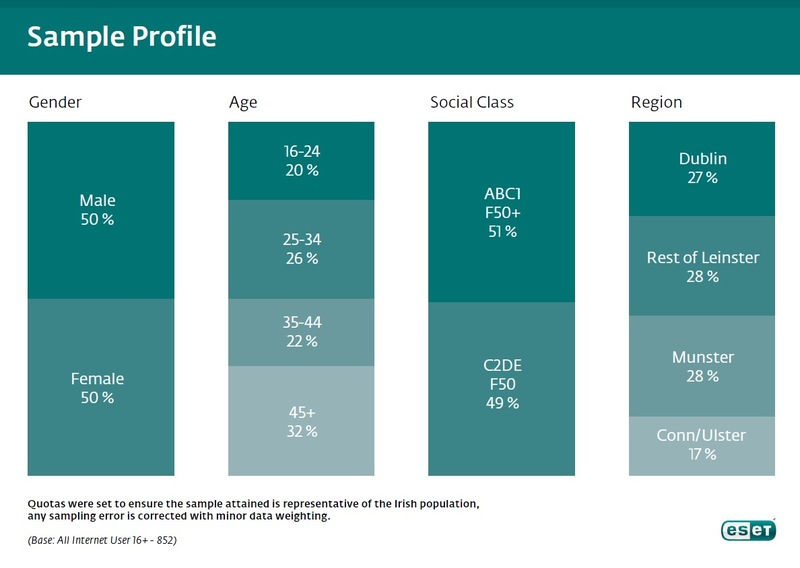 We asked Irish computer users if their passwords resemble any in the several groups we made available, which resemble different levels of complexity and therefore increasing levels of protection. So, acording to the survey, the passwords situation in Ireland is a bit better than is the case with the global average, but still there’s no room for complacency, because after all, cybercriminals are after YOUR money. Cybercriminals want our passwords. They can hack into our email, our social networks, then steal our identity and mail our friends or insitutions with financial scams in our name, which could even get us in trouble. They try to get into our PayPal, eBay and Amazon accounts, into other online shopping sites, even our online banking – to steal our money. All these use a password and if it is weak, then our accounts are vulnerable. 1. Letters-numbers-punctuation. Use all these in a password. 2. Don’t use easy to guess things such as your name, date of birth or other similar info that can be gathered from your Facebook profile. 3. Invented or misspelled words are better than real ones for passwords. 4. Don’t use the same password on several accounts or machines. 5. Change your passwords in regular intervals. To learn about all the tips and tricks to create a strong password in detail, read this guide by ESET security expert David Harley, as well as the password strategies here. Or see if you can make use of this password generator. CyberThreats Daily: As Twitter reveals a user’s identity, what now for free speech? It’s also a good idea to use Irish words in your passwords, since they’re not so susceptible to dictionary attacks. For example: “Is maith liom cáca milis.” is likely to be a lot stronger than “butt0n!”.